Ryson Spiral Installation: Most Most Ryson Spirals are shipped in one piece pre-assembled and pre-tested, thereby drastically reducing the time and cost of installation. Certain spirals will for shipping purposes be delivered with some components detached. They include spirals equipped with extended in-feed and out-feed tangents or spirals with a diameter larger than 8 feet. Consult the manual supplied with your spiral for more information. All spirals are shipped in an A-frame equipped with casters. This facilitates easy unloading and transfer to the installation area. Two reinforced fork pockets are provided in the center tube at the bottom end of each spiral. These pockets are clearly marked and will safely facilitate horizontal forklift handling. The top end of the center tube is used for rigging when standing up the spirals. 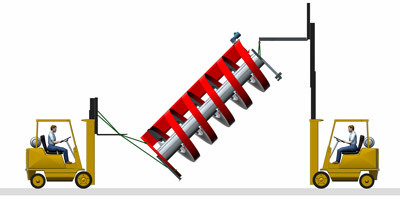 Watch a video that shows the standing up of Ryson Spiral Conveyors. Only use the two reinforced fork pockets provided in the bottom end of the center tube when unloading and transporting the spiral. Lift the pocket end of the spiral and move carefully while the transport frame (with casters) is supporting the opposite end. The top end of the center tube is used for rigging when standing up the spiral. Use only properly rated wire rope or chain slings. Use a forklift or boom truck. Use a second forklift to assist and to make sure the spiral clears the floor when lifting. Use only properly rated poly slings or straps. Caution: Check to make sure all slings and straps are properly secured before lifting. Remove transport legs and install the spiral support legs (bolts down)while the spiral is hanging. Remove transport frame when spiral is standing. Lift the pocket end of the spiral and move carefully. A second forklift is required to maneuver and turn the spiral in tight areas. The top end of the center tube is used for rigging when standing up the spiral. Use only properly rated wire rope or chain slings. Use a boom truck or crane. A crane is necessary for spirals above 24 feet. Use a second forklift to assist and to make sure the spiral clears the floor when lifting. Use only properly rated poly slings or straps.